The critical patients at the 900-bed Indira Gandhi Medical College and Hospital (IGMC) here are either referred to the PGI, Chandigarh, or forced to rough it out in the general wards as there are no surgical intensive care units (SICU) or medicine intensive care units (MICU) on the campus. 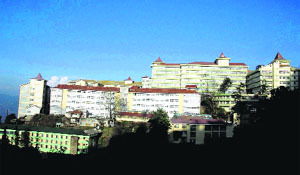 The Indira Gandhi Medical College and Hospital in Shimla. A team of forest officials from the state will visit Doha in Qatar to ensure that all goes well and the Great Himalayan National Park (GHNP) gets the UNESCO World Heritage Site status. The recent spurt in cement prices in the state has spurred smuggling in border areas of lower Kangra district comprising Nurpur and Jawali subdivisions. The ill-fated Himachal Road Transport Corporation bus, which had killed 15 persons and injured 50 on Monday evening, developed a mechanical snag. Anguished over the gangrape of a 17-year-old minor girl that took place in Shimla on May 16 this year, the Women Commission has decided to go proactive on women safety. Filing defamation cases and then taking them back has become a habit for Himachal Pradesh Chief Minister Virbhadra Singh, said BJP spokesperson Ganesh Dutt here today. He added that the move to take back the defamation case against BJP leader Arun Jaitley would not save Singh from the corruption cases against him. 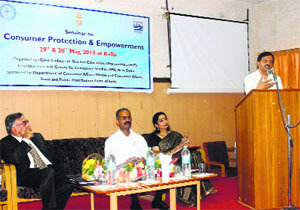 Prof Suresh Misra, Chair Professor and Coordinator, Centre for Consumer Studies (CCS), Indian Institute of Public Administration (IIPA), presided over a two-day seminar on consumer protection and empowerment. It was organised by the Government College of Teacher Education (GCTE), Dharamsala, in collaboration with IIPA, Devsaran, here today. The seminar is sponsored by the Ministry of Consumer Affairs, Food and Public Distribution. Industry Minister Mukesh Agnihotri today dedicated the newly-constructed building of the Primary Health Centre (PHC) at Badheda village in Haroli constituency to the public. The building has been constructed at a cost of Rs 27 lakh. Ramesh Chauhan, who recently took over as the vice-chairman of the HP Khadi and Village Industries Board, spelt out his priorities and said the crucial issue pertaining to enhancing the loan limit from Rs 25 lakh to Rs 50 lakh would be taken up with the state as well as the Centre. Residents of the Holi tribal areas in Bharmour, Chamba district, have demanded 70 per cent employment in the Bajoli-Holi hydroelectric project as agreed by the state government. They threatened to launch an agitation if the employment ratio fixed by the government was not followed by the project management. Come summers, water woes of the Queen of Hills come alive. In spite of rain at normal intervals this year and the peak summers yet to arrive, several parts of the town are reeling under water shortage due to inadequate or irregular supply of water by the Shimla Municipal Corporation (SMC). Surender Verma took charge as the new Superintendent of Police (SP) of Kullu yesterday. He replaced Vinod K Dhawan. A two-day seminar on “Recent Perspectives on Himalayan Buddhism” was held at the Indian Institute of Advanced Studies (IIAS) to know the current approaches and methods used by scholars of various disciplines to analyse different facets of Himalayan Buddhism. A communication tower being erected by a private service provider in Sector 2, New Shimla, has raised the ire of residents. They claim that the tower will create nuisance and health hazards for the residents. The consumer courts will be able to act suo motu after the proposed fourth amendment in the Consumer Protection Act. The Himachal Pradesh Government today declared June 5, 2014 as local holiday on the occasion of Shimla Summer Festival for the employees working in all government offices, boards and corporations and educational institutions falling under the Shimla Municipal limits. In order to save apple growers from difficulty in transportation of their produce, Chief Minister Virbhadra Singh has directed the private company, which is working on the Kharapathar-Hatkoti road, to complete the ongoing work at the earliest. The National Drug Regulatory Authority (NDRA) has constituted an international cell to monitor faulty drug export cases. The decision of the state government to push through the Pabbar gravity water supply project in preference to another project, envisaging lifting of the Sutlej water from the Kol Dam, may cost heavily to the state. Former Director-General of Police DS Manhas has withdrawn his petition from the HP High Court, through which he had sought the quashing of a show-cause notice issued to him and his wife by the Municipal Commissioner over unauthorised construction at their residence in the Nav Bhar area of Shimla. The Himachal Pradesh High Court has directed the state government to comply with labour laws strictly and further cautioned the authorities that any breach will be seriously viewed. With a view to monitoring nuisance created by miscreants at the Chamba Regional Hospital, CCTV cameras will be installed on its premises so that the footage of incidents of misbehaviour with doctors and other staff can be recorded for bringing the culprits to book. Four students from International Institute of Fashion Designing (INIFD) would participate in this year’s Lakme Fashion Week (LFW), being organised in Mumbai in the month of August. A spate of thefts during the past few weeks has rocked the town, with miscreants targeting not only shops, but also a house and decamping with cash and valuables. As many as 23 passengers, including three women and a child, were injured when a private bus they were travelling in veered off the road and rolled down a hill near Chilly in Churah subdivision of Chamba district today. The Jogindernagar unit of Himachal Kisan Sabha (HKS) has demanded an immediate demolition of a wall which was blocking passage to a residential colony here. Sportsmen from the district have won the overall trophy in the three-day state-level Olympics for special children, which concluded here yesterday. Besides, there is no emergency diagnosis service, even for the patients in shock, after 4 pm in this state’s top hospital. The emergency car is being run from the six-bed ICU under Department of Anesthesia, which is hardly available for the patients in shock or trauma rushed in from the state. The four arterial blood gas analysers (ABGA), one each in cardiology, cardio-thorasaic, ICU and chest and pulmonary unit, are not available after 4 pm, revealed a senior doctor on the condition of anonymity. The recent bus accident exposed how ill-equipped the emergency services were at the institute. The ICU was occupied and the critical patients were referred to the PGI. Similarly, an accident victim died recently at the hospital as there was no bed in the ICU, he added. The hospital has no well-equipped SICU attached to the surgical ward and no MICU attached to the medicine ward. The 10-bed ICU at the pediatric ward, started recently, has come as a life-saving facility. All ministers, including the successive Chief Ministers, have visited hospital either to meet accident patients or for some occasion, but do nothing to improve the emergency services here, the doctors complained. As many as 35 patients rough it out on the trolleys. Most beds remained occupied mainly in the surgical, medicine and pediatric wards. As per medical standards, the IGMC is a referral hospital and its surgical and medicinal wards should have separate SICU and MICU to take care of critical patients, said the doctors. Dr Ramesh Chand, senior medical superintendent, IGMC, said emergency services are being strengthened in the hospital and 24x7 diagnosis service would be available soon. “We will club all the four ABGA equipments at emergency and provide diagnosis for patients 24x7 hours, but we need more kits and technical staff for this”, he added. The International Union for Conservation of Nature (IUCN), the advisory body of UNESCO’s committee on nature, has nominated 12 sites across the world for granting world heritage status site. A team of senior officials from the state will be in Doha, when the crucial meeting of UNESCO World Heritage committee would be held between June 15 and 25 to take the final decision. “We are very hopeful that GHNP will this time be granted the world heritage site status,” said Tarun Sridhar, Principal Secretary, Forest and Revenue. He said all queries that had been sought had been sent and hopefully this time the GHNP would make it to the list of UNESCO’s world heritage site list. The matter for the grant of world heritage site for GHNP has been in the pipeline for the past sometime, but was being delayed for one or the other reason. In fact, the IUCN committee has almost cleared the case about a year ago, but necessary formalities could not be fulfilled due to the Assembly elections in December 2012. The issue was also discussed at the 37th Committee Session of UNESCO held in Cambodia. UNESCO was keen that the formalities such as issuing the notification for including an additional 90-sq km area in the Sainj Valley and 61-sq km in the Tirthan Valley be done so that the total area of the GHNP increases to 905 sq km from the present 754.4 sq km. “The proposal for including these areas has already been approved by the Supreme Court and the issue is pending with the Deputy Commissioner, Kullu, for the grant of settlement rights to people,” a senior official said. To ensure that there are no hitches, the state government had even approached the Wildlife Institute of India to help identify GHNP’s outstanding universal value to pave way for bestowing world heritage status on it. It is well-known for its exquisite flora and fauna. It has a wide variety of wildlife habitats and high biological diversity within a small area. The state has three cement-manufacturing companies such as ACC, Ambuja and Jaypee, which have enhanced the price by	~25 per bag just after the Lok Sabha elections. At present, a cement bag of these companies costs around ~338 to 340 which was being sold for ~315 before May 7. The companies have raised the rates thrice during the last 15 days. Intriguingly, a cement bag of these companies is being sold for ~310 in neighbouring Punjab. Inquiries reveal that a difference of ~25 per cement bag has boosted the smuggling of cement from different inter-state routes of Punjab. Though cement is being manufactured in the state, it costs dear here. There is a lot of resentment among local cement dealers and builders over the increased smuggling of cement across border areas of Kangra. They alleged that the rampant smuggling of cement takes place from Dunera, Chakki and Hazipur, three entry points of inter-state routes. They say its smuggling has adversely affected their business as most consumers are buying cement from Punjab dealers. Besides, it is causing a loss of revenue to the state exchequer which is being deprived of various taxes and VAT on cement, they claim. Sukesh Kumar, a leading dealer of the area, has urged the state government to ensure the same prices on all brands of cement as are being charged by dealers in Punjab. The removal of price difference will automatically curb the menace of smuggling, he asserts. The driver struggled and tried his best to cut the bus hillside, but failed, revealed a preliminary finding from the site of the accident. Eyewitnesses, including victims of the bus accident, revealed that the bus developed some snag. The driver tried his best to cut the steering, but failed, though the bus was moving along the hillside. The road where the accident took place was wide and the spot not accident-prone, revealed passengers. Transport Minister GS Bali, who inspected the accident spot yesterday, said he had directed the core team of TATA motors to examined the ill-fated bus and submit the report to the department soon. Even Chief Minister Virbhadra Singh has sought a report from HRTC in a couple of days as the survivors pointed out that the 40-seater bus was in a bad shape and overloaded carrying 75 passengers, including schoolchildren. HRTC managing director RN Batta said the preliminary inquiry revealed that the bus was purchased in December 2010. The magisterial inquiry ordered in the Balghar bus accident is yet to be completed. Eyewitnesses, including victims of the bus accident, said the bus developed some snag. The driver tried his best to steer the vehicle away, but failed, though the bus was moving along the hillside. The road was wide and the spot was not accident-prone, passengers said. It has urged the Police Department to conduct awareness workshops for girls in schools, colleges, universities and work places to train them in self-defence techniques. “There has been a spurt in crime against women in the recent past and lurking fear of insecurity grips women. Hence it is imperative that women should be trained in self-defence and provided necessary tools to instil confidence in them,” she added. She said public should be made aware in general so that they could handle any situation and deal with roadside-romeos. “But at the same time the adolescent girls should also be told about the do’s and don’ts and how to respond when in such a situation,” she said. She said the recent gangrape could have been avoided had the couple been aware of their rights. It was the lack of courage of the boy accompanying the girl that led to such an unfortunate incident, she added. The police should raid isolated places where the couples go for dating and students should also be cautioned that wandering at deserted place could land them into trouble. The incident should be a warning for others teenagers who should take necessary precautions for their safety and security. The police have released the sketches of the two accused but the girl who is in trauma is unable to identify the culprits which has come as a major obstacle in the police investigations. Kullu DC Rakesh Kanwar was the chief guest on the occasion. In his address during the inaugural ceremony, he said in the era of financial liberalisation and consumerism, awareness of the consumers was a must. He said consumers should know the authority and process for appeal. Justice and relief could be sought from either district, state or the National Consumer Forum by writing a complaint and the applicant could contend himself without having to appoint a lawyer, he added. Misra said the aim of the seminar was to create awareness about the Consumer Protection Act (CPA) and to examine the problems faced by consumers in the service sectors like health, insurance, banking, telecommunication and food safety. He said the CCS had set up a national toll-free helpline and a call centre providing assistance to over 15,000 consumers daily and such helplines would soon be launched at the state level also. The thrust was on the doctor-patient relationship and medical negligence under the purview of the Act. Avoiding immediate treatment when required, administering medicines without test dose, improper post-operative treatment, erroneous surgical wound, improper prescription of drugs, leaving medical instruments in body and apparent lack of care in surgery and anaesthesia were major cases of medical negligence. Seminar coordinators Prof Rashmi Ramol and Dr Sanjay Singh Pathania of the GCTE also spoke. Officers from various departments, professors and lecturers of various colleges and schools, representatives from panchayats, mahila and yuvak mandals were present. Later, addressing a gathering, Agnihotri said Rs 11 crore was being spent in Haroli segment during the current financial year for construction of health infrastructure. He said a research cell of the Indian Medical Research Council (IMRC) had been made functional at Haroli at a cost of Rs 4.5 crore and 20 minor research projects to study the pattern and incidence of some diseases in the region had been sanctioned. The minister added that the PHC at Panjawar was being constructed and the Haroli PHC was being upgraded to the status of Civil Hospital. Dr GR Kaushal, Chief Medical Officer, Dhanvir Thakur, SDM, and Ranjit Rana, block Congress president, were also present. Addressing mediapersons here today, he said since the board had immense scope to provide assistance to the people by way of loans, an effort would be made to reduce the rate of interest to an affordable 4 to 5 per cent. He said the board extended loans for seven types of works, but people were unaware of its functioning and disseminating information to people through awareness camps would be management?s' utmost priority. As a step towards helping the youth, he said the state government's flagship programme of skill development allowance would be linked to the board?s loan schemes and this would enable trained youth to open self-employment avenues. He said though the board had shops in all districts, a few of them had been closed in the past. An effort would be made to restart them and six plots lying unused in Kangra would be made available to youth to open employment avenues. Despite running at a loss of Rs 56 lakh and lacking a staff strength of 50, the management would try to create financial resources and sell goods which would cater to the market demand. They also demanded safety measures like first-aid and ambulance facilities for the labourers working at the construction sites of the hydropower project. There was a need to sprinkle water near the construction areas and the roads connecting the Holi tribal villages daily so that the dust could not damage the ecology of the area, the villagers said. Faced with the chronic problem of leakage, which has been reduced from 42 per cent to 27 per cent, the SMC’s minimum demand of water is 42 millions litre per day (MLD), but the available supply ranged between 35-37 MLD per day causes a shortage of 5-7 MLD per day. During the peak tourist season, the average population of the town crosses three lakh and the supply gap increases to 17 MLD. Residents then face perpetual water shortage. Established in 1875 to serve a population of 20,000, the Shimla water supply system has been augmented five times from 4.54 MLD to 34.86 MLD, but a study conducted by the National Environmental Engineering Research Institute (NEERI) in 1986 established the leakages more than 45 per cent. The SMC changed the pipelines and took other measures to plug the leakages, but it is still around 27-30 per cent. The water is coming from five sources, including 15-17 MLD pumped from Guma and Nauti khud, 9 MLD from Ashwani khud, 10-14 from Giri, 2-3 from Churad and 0.5 MLD from Ched. The storage capacity of 10 main reservoirs at Craignano, Sanjauli, Ridge, Mansfield, Mashobra, Seog, Kasumpati, Viceregal Lodge, Jakhoo and Boileauganj is 36.95 millions litre per day. While residents of some localities complain of getting water on alternate day and that too in trickles, SMC Commissioner Amarjeet Singh maintains that there had been no major problem during the current summers and difficulty faced by people on two or three days was mainly due to erratic power supply and old water distribution system leading to leakages. As per a study conducted by the Irrigation and Public Health Department, the permanent and floating population of Shimla will mount to 4,15,497 and 2,39,398 by 2037 and the requirement of water will be 105.60 millions litre per day, This implies that water supply will be required to be augmented by 70 millions litre per day. Huge leakages in water supply due to old water distribution system, shortage of maintenance staff, cleaning of tanks by the Irrigation and Public Health Department and erratic power supply with problems of low voltage are main constraints, says the commissioner. “We start the distribution of water at 4 am, but frequent tripping affects the pumping of water creating shortage in some areas,” maintain municipal officials. There are about 27,000 water connections in Shimla. Out of these 21,000 are domestic while 6,000 are commercial and the per capita per day availability (LPCD) is 110 against the prescribed norms of 135 (LPCD). The situation would have been better had the Jawaharlal Nehru National Urban Renewal Mission (JNNURM) project, envisaging an expenditure of ~72.36 crore for the rehabilitation of water supply scheme for Shimla, been implemented. But the departments concerned wasted five years in passing the buck. Addressing mediapersons at a press conference here today, the SP said maintaining law and order should be a joint effort of members of society and the police. He said masses should obey the law and it would work for the betterment of society. As per World Health Organisation (WHO) statistics, India witnessed the highest number of deaths due to road accidents and his thrust would be on traffic discipline and road safety, he said. Replying to a question, Verma said the Manali issue was a big challenge for the police, as implementing the orders of the National Green Tribunal (NGT) had caused resentment among local residents. Every effort would be made to maintain law and order and avoid inconvenience to tourists and local people. He said scientific investigation techniques would be emphasised to solve theft cases. Patrolling had already been intensified in the town to prevent incidents of theft. The drug menace was a social evil and the charas mafia active in the region would be eradicated. Scholars from Banaras Hindu University, Delhi University, University of Jaipur, Assam University, University of Baroda, Central University of Tibetan Studies, Sarnath, and the Central Institute of Buddhist Studies, Leh, took part in the seminar which concluded here yesterday. The varieties of Buddhist monastic disciplines, cultural practices, visual expressions, rituals, debates and controversies have been under investigation among scholars for the last 30 years. The region covered included a vast expanse of the Himalayan geographical region from Gilgit in the northwest to Arunachal Pradesh in the east, Ladakh, Himachal Pradesh, Uttarakhand, Mnga’-ris (Western Tibet), Nepal, Sikkim, Bhutan and Arunachal Pradesh. The welcome address was given by Prof Chetan Singh, Director, IIAS. Prof Laxman S Thakur, Dean, Faculty of Social Sciences, Himachal Pradesh University, was the convener of the seminar. The participants shared results of their research on Himalayan Buddhism. Many unresolved problems and questions such as did Lord Buddha visit the Kullu valley, who will succeed the present Dalai Lama and where was the chos-khor (Buddhist Council of Western Tibet) held were discussed. The first session was chaired by Prof Radhavallabh Tripathi in which three papers were presented by Prof SN Dube, Dr Banarasi Das and Prof KTS Sarao. The concluding lecture was presented by Prof Laxman S Thakur. Dr Amrit Varsha Gandhi, presented her paper “Women as Catalysts for socially engaged Buddhism: A study in Kinnaur”. The entire Himalayan landscape is dotted with pictured prayer-stone tablets, tiered chortens and long rows of fluttering flags seen atop monastic settlements. The participants agreed that Buddhism provided an emotional link among the Himalayan communities despite their distinct ethnic and linguistic identities. They said the company had not got a no-objection certificate (NOC) from the residents and the Shimla municipal corporation had never sought the same from the company. “It will be a constant nuisance for us and we have brought it to the notice of the mayor,” said RK Thakur, a local resident. They demanded that the towers should not be allowed in residential areas, as it posed radiation hazards, besides nuisance and pollution as these are run by diesel-run generators when electricity supply runs out. Sanjay Chauhan, mayor, said they had stopped the work at the spot after they received the complaint. The company had not got NOC from the corporation so far, he added. Amarjeet Singh, Municipal commissioner, said they had sought a report from the junior engineer of the area on the tower before taking an action against the company. The company had to seek permission from the corporation for the purpose, he added. It will be a constant nuisance for us and we have brought it to the notice of the mayor. We have sought a report from the junior engineer of the area on the tower before taking action against the company. The company had to seek permission from the corporation for the purpose. This was stated by Prof Suresh Mishra, chair-professor and coordinator, Indian Institute of Public Adminstration (IIPA), while addressing mediapersons here yesterday. He was here to inaugurate the two-day seminar on consumer protection and empowerment. The seminar is being organised by Government College of Teacher Education, Dharamsala, in collaboration with the Indian Institute of Public Adminstration. The seminar commenced here today. He said the main objectives of conducting the seminar were to create awareness about the Consumer Protection Act and to examine the problems being faced by the consumers in the service sectors such as insurance, banking, telecommunication and food safety. The participants will be apprised about various steps being taken by the government to protect consumers. The move is expected to motivate participants who would be the messengers of the awareness campaign, he further added. The Chief Minister, who presided over a meeting at Rohru yesterday, directed the officials concerned to ensure repair and maintenance work of all roads in upper Shimla with priority to the Kharapathar-Hatkoti road besides improving the condition of Khabal-Dhanwari, Sheel-Baral-Karchhari, Thalli-Amoi-Tiproli-Gokswari link roads so as to facilitate commuters as well as horticulturists. He directed the officials to ensure completion of bridges, including Barsheel, Shishiyara, Bakholi, Ghushali, Nigalu, Bakhirana and Sandhor footbridge. The Chief Minister said the authorities might opt for pre-fabricated structures in the remote Dodra Kwar area to avoid unnecessary delay in constructing government buildings and asked the officials to identify place for construction of the Rest House at Dodra. He directed the IPH authorities to explore possibilities of channelising the Pabbar river costing around Rs 100 crore so that the project could be submitted for funding to the Government of India. He said experts from the Central Water and Power Research Centre, Pune, who are studying the channelisation of the Pabbar, would reach here soon. He also directed the officials to install as many as 10 transformers in the area to solve the low voltage problem. The Chief Minister said adequate funds were being provided for renovation of ancient temples and grant-in-aid had been enhanced. As many as 50 craftsmen and artisans were assigned the task to complete renovation of Narain temple in Rohru in 2007 and completed at a cost of Rs 3 crore, he added. The regulatory authorities are keen to address the issue as drugs which do not confirm to laid norms in various countries fetched a bad named to the domestic pharmaceutical industry. The cell will review all complaints pertaining to faulty exports and initiate appropriate investigation of complaints. It will also seek international cooperation among regulatory agencies of various nations and exchange information on product recalls, emergency notifications, and cases where drugs are found of sub-standard quality. To make this endeavour meaningful, a Memorandum of Understanding (MoU), Joint Working Group (JWG), Statement of Intent (Sol) etc, would be formed. The cell will ensure that there is a grant of written confirmation for export of active pharmaceutical ingredients as per the European Union directives. While guidelines relating to its functioning and responsibilities were being chalked out officials said visits of international delegates to pharmaceutical units would also be handled by this international cell. Drugs manufactured by several pharmaceutical units, including Ranbaxy in Paonta Sahib, had come under the scanner of the US drug authorities, who had raised issues relating to quality. Several cases of pharmaceutical units failing to abide by international norms had cropped up where the regulatory authorities on being questioned by the international agencies were found lacking in information. Out of nearly 300 pharmaceutical units present in the BBN area, nearly 150-200 cater to exports to various countries such as USA, European Union, UK, Australia, Kenya, Uganda, Ukraine, Kazakhstan, Sri Lanka among others. The Pabbar gravity project costing about Rs 1,307 crore and the Sutlej lift water supply project estimated to cost Rs 515 crore for Shimla were discussed by the Cabinet on May 17. Overruling the objection of the Centre and opinion of the state Irrigation and Public Health Department based on engineers’ recommendations which opposed the project, the IPH minister reportedly had her way and the government decided to submit the project proposal to the Centre for World Bank funding. The minister also met former Finance Minister P Chidambaram to get clearance, but no assurance was given and now with the change of guards at the Centre, the chances of the project being approved were minimal and the state may not get approval for any of the two projects. Lack of coordination and casual approach of different departments was fully exposed as two separate projects were sent by the IPH and Urban Development Department and pursued by respective departments for World Bank funding, but the Union Government rejected the Pabbar gravity project on the ground that it was unviable as its cost was too high. The source did not have a perennial snow cover, large forest areas were involved, getting environment clearance was an issue and the pipeline for bringing water to Shimla was too long. The project conceived in 2007 envisaged availability of 45 MLD of water every day to meet the requirement of the town over the next 30 years. A detailed report was to be prepared for posing it to the centre for World Bank funding, but the matter was not pursued. In the meantime, another project proposal to lift the Sutlej water from the Kol Dam, which was three times cheaper as compared to the Pabbar project, was mooted by the Urban Development Department and two proposals were running simultaneously, but even after the Pabbar project was trashed by the Centre, the state government continued to press the unviable project. The government had also revised the Sutlej project and its cost was moderated to Rs 395.96 crore which was three times less than the cost of Pabbar project. The Centre also wanted the state to send a comprehensive project, but the state was nonchalant and now it stands on brink of losing both projects. 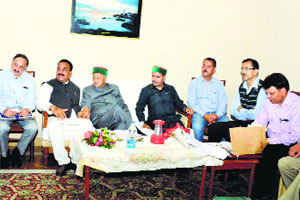 However, with the population of Shimla growing at a very fast rate, the government has little option except executing some mega water supply augmentation project, but the government is working on considerations other than the interests of residents of the town who are facing perpetual water shortage which become chronic during the summers. Why is Pabbar project unviable? Counsel for Manhas pleaded with Justice Sureshwar Thakur that Manhas wanted to withdraw his petition and the same was allowed. However, the court had given liberty to the former DGP to take up all permissible grounds as available to him under law before the Municipal Commissioner. The court said the same would be considered and disposed of by the Commissioner in accordance with law. Justice Thakur further observed that it would also be open to the petitioner to lay claim for his purported deviations being compounded, if permissible under law. In his petition, Manhas said the Municipal Commissioner had issued them the notice on October 10, 2013, alleging that they had carried out additional construction at their house without the permission of the Municipal Corporation. He said the notice was not sustainable as it was time barred. It did not allege any time and date or period when the petitioners allegedly carried out the additional construction. Besides, the proceedings initiated by the Commissioner were nothing but vindictive and mala fide proceedings to harass the petitioner and his wife. The order was passed by a Division Bench comprising Acting Chief Justice Mansoor Ahmad Mir and Justice Tarlok Singh Chauhan on a public interest litigation wherein the issue of non-implementation of the labour welfare laws in the state by the government agencies was raised. The Bench further directed the Chief Secretary, Labour and Industries secretaries and the Labour Commissioner to draw action, wherever required and file compliance report before the Additional Registrar of the court after every three months. In its earlier order, the High Court had directed the state to file affidavit explaining its position on the issue of non-implementation of the labour welfare laws in the state by the government agencies. In compliance to this order, the state has filed an affidavit stating that the provision of working hours, weekly off, overtime and casual and sick leave and national and festival holidays are ensured to be implemented as per provisions of the Minimum Wages Act, 1948, Factories Act, 1948 and Industrial Establishments (Casual & Sick Leave and National & Festival Holidays) Act, 1969, by way of inspections and redressal of such grievances received from any person. It further informed that similarly, the safety of women workers is ensured as per relevant provisions of labour laws. It further explained that periodical inspections of factories and other establishments engaged in other activities are conducted in random as well as periodical manner and the offenders are being prosecuted in the court of law so that a deterrent is maintained and the provisions relating to prescribed working conditions, safety, social security of the workers engaged in various activities are ensured and simultaneously industrial peace is maintained. After perusing the affidavit, the High Court directed the state to strictly implement the labour laws. A decision to this effect was taken at a meeting of the governing body of the Rogi Kalyan Samiti. The meeting of the governing body was presided over by Deputy Commissioner, Chamba, KS Vasant here on Tuesday. Nikita, Parvati, Priyanka and Lalita would be displaying their dresses in the fashion week. 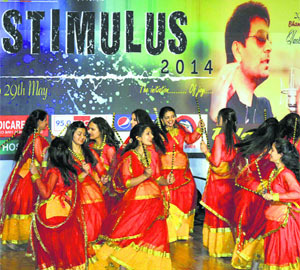 Sat Pal Sharma, Managing director of the institute, said the students were working hard on their designs and their participation in the event was a matter of pride for the institute. Meanwhile, a one-day workshop for para-legal volunteers was organised here today which was inaugurated by Rattan Singh Thakur, District and Sessions Judge. The police appear to be clueless about the miscreants, leading to a sense of insecurity among residents. While four chemist shops located on the Mall Road here were broken into a few days ago, the house of a local resident of Ward No. 6 was burgled when he was out of town. As no cash or drugs were found missing from the chemist shops, the police assumed that it was the handiwork of drug addicts who could be possibly on the lookout for sedative drugs. A sum of Rs 15,000 was looted from another chemist shop on March 10, while electronic goods, including laptops and 25 mobile phones, and cash were stolen from three other shops in the town on March 23. The spate of thefts not only reveals the lack of patrolling and effective policing by the district police. ASP Padam Chand said shop owners had been warned against keeping cash at their shops at night, adding that the police had stepped up patrolling to check thefts. Superintendent of Police (SP) DK Chaudhary said no casualty was reported in the accident. The SP said the injured were admitted to nearby Tissa hospital. All occupants of the bus were residents of the surrounding areas. A case of negligent driving had been registered against the bus driver at the Tissa police station and further investigation to ascertain the cause of accident was on, the SP said. HKS state joint secretary Kushal Bhardwaj said a delegation of the HKS submitted a memorandum to SDM and executive engineer PWD, Jogindernagar, and demanded immediate demolition of the wall constructed illegally in the Tikari–Mushehra panchayat falling under the Chauntra block. He said an influential government employee had raised the wall illegally and authorities had failed to take action. The HKS would be forced to move the High Court in case an action is not taken in the matter. The players won 20 gold, 16 silver and 8 bronze medals in different events in the sports meet. Nearly 300 students studying under the Sarva Shiksha Abhiyan and through 4 non-governmental organisations had participated. The organisers of the games thanked the district administration and different organisations for helping in making the games a success.